It’s hard to believe one month has already passed since the 2019 began… Anyway, my portfolio provided quite an amazing return in January. You can see that total dollar gain (realized + unrealized) is now over $22,000 and the cumulative time-weighted return is almost 100% now! Even after comparing with the market, you can see how well my portfolio played in the month of January. I can attribute the most of the out-performance to one stock: Kikukawa enterprise (Tokyo Stock Exchange: 6346). This was a classic value play. At the time of my stock purchase, the company had 1.5 time more cash than its market cap, while being profitable. 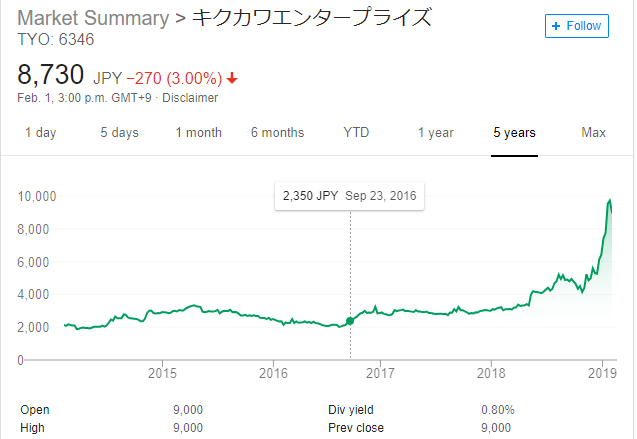 I bought the stock at JPY2,250/share (it was actually JPY225/share that time but there was a reverse split thereafter). In January, the stock price shot up thanks to an exceptional business performance (4 times YoY earnings growth). I sold the stocks at 7,990/share since the stock price caught up with its book value. Though it is a decent business. I decided to sell the stock since I just wasn’t sure how sustainable their growth was. The stock is still going up after I sold it but it’s ok, no point of being too greedy. I am content with the 200% return (about $8,000 realized gain) and the fact that my investment thesis nicely played out. Also, my all time favorite stupidly undervalued gold stock, Gran Colombia Gold (Toronto Stock Exchange: GCM) started to shine as the gold price has climbed. I see that the company has been working hard on IR promotion, I even saw an ads on Youtube recently! This is a potential 10-bagger or even a 100-bagger (if gold price shots up) for me and I will probably hold it dear for over next 10 years. On a side note, as my positions grew larger, I am increasingly taking a defensive position. My portfolio is now over 30% cash and I have some put options on SPX and GDX, hedging for both stock market and gold price downturn. I am planning keep my defensive positions until I see the next major market downturn (potentially S&P500 below 2,100). If the market keeps doing well, my portfolio may lag the market in near future; however, I’m ok with that. It’s better to be safe than sorry. Besides, I don’t need to always beat the market. I just need to find right stocks at right price. Like, follow and share my facebook page! Like, follow and share my twitter account and posts! Subscribe to my blog using the dialog below! Feed your RSS feed by using the URLs below! Portfolio Update (Dec 2018): over $17,000 gain! While almost all the indices have go down across the globe this year, my portfolio showed an incredible resiliency. Now the gap between my portfolio return and the indices are over 40%. Now the cumulative return of my portfolio is over 80%, near the all time high since the inception. The total gain (Ending NAV - Deposits) is over $17,000. The three actions I took in November, which were mentioned in the previous portfolio update, seemed to have worked quite well so far. I managed to purchase 200 Garrett motion stocks with the average effective price of $11.5 by selling the Dec put options. Now the stock is trading near $12.3. Although the stock price could fluctuate widely, I’d say I did a pretty god job having the 7% return albeit amid such market turbulence. The timing of purchasing the bear put option (Long put: $2,600, Short put: $2,400) on the S&P500 was not bad either. The position is in the money as the S&P500 is now trading around $2,500. I may write an article on the usage of bear put option later in the blog. I sold one more put option on Garrett Motion (Strike: $12.5, Jan expiry, Price: $1). If the put option expires in the money, I can purchase 100 more Garrett stocks with the effective purchase price of $11.5 again. (Stock is now traded around $12.3). Are you curious how my portfolio will perform in 2019? Subscribe to my blog and stay tuned! !